The Samson SecurGuard Range of doors are designed to resist potential intruders. The Steel Doorsets can be used on various types of premises and have different resistant levels against unwanted intruders. Security doors offer a physical barrier that is designed to deter and delay intruders for a specified time period. The Samson SecurGuard Range has been tested to and passed Warrington Exova Certisecure STS 202 and PAS 24 standard and are included in the 'Secured by Design' scheme; the official UK Police initiative to 'design out crime'. Samson Security Doors have been tested to and passed BS EN 1627:2011 and are available in a variety of LPS 1175 security ratings from SR2 to SR4. 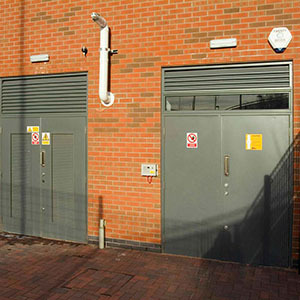 Samson Security Doors have also been tested to European Security Standard DD ENV 1627:1999. SR2, tested to LPS1175 SR2: Offers up to 3 minutes resisting an opportunist burglar forcing entry of protected premises with various tools such as levers, drills and skrewdrivers. Ideal for domestic properties or commercial premises where a level of security is required. SR3, tested to LPS1175 SR3: Offers up to 5 minutes of resistance during a determined break-in of protected premises using tools such as a crow bar, short axe and cordless tools. The SR3 is ideal for commercial premises or buildings with a risk of burglary. SR4, tested to LPS1175 SR4: Offers up to 10 minutes of resistance when undergoing a break-in by a more experienced burglar using tools such as a sledgehammer, power drill and high powered cordless tools. With the greatest levels of resistance throughout the range, the SR4 is suitable for applications where there is a significant risk of attack. SecurGuard +2: Offers protection for premises with low to medium risk from opportunist break-ins. This range of doors proves to be ideal for residential, apartment, and social housing applications. SecurGuard +3: Provides protection for medium risk properties in both residential and commerical applications at risk of break-ins using heavy hand tools. SecurGuard +4: Provides protection for properties at higher security risks and in danger of experienced break-ins using various tools or even explosives.